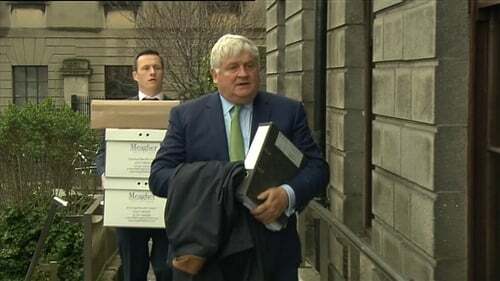 The High Court has heard that the Sunday Independent newspaper did not apologise in any form, for an article in the newspaper in 2012, about Denis O'Brien's loans with Anglo Irish Bank, despite Mr O'Brien's evidence last week that he believed there had been such an apology. Last week, during his defamation action against the Sunday Business Post, over articles published in 2015, Mr O'Brien initially said he had not taken any action about the 2012 article but the following day he told the court he wanted to correct the record. Journalist Tom Lyons was involved in writing the articles in both newspapers. Mr O'Brien claims the Sunday Business Post articles in 2015, based on a report by accountants PwC into Ireland's banks and their biggest borrowers, portrayed him as one of a gang of 22 "developer kings" who overborrowed, received cheap and easy money, destroyed the country and bankrupted the banks. The 2012 Sunday Independent article was based on a PwC report into Anglo Irish Bank's top borrowers and described 13 men, including Mr O'Brien, as "buccaneer borrowers". Mr O'Brien claimed the Sunday Independent had higher editorial standards than the Sunday Business Post. The following day, he told the jury he wanted to correct the record and said his spokesman had lengthy correspondence with the Sunday Independent about the 2012 article, which he believed ultimately led to an apology from the then group managing editor about the coverage. Mr O'Brien was asked to produce the correspondence and the case was adjourned. But a letter from his solicitors read to the court this morning said there was no document apologising for the 2012 Sunday Independent article and there was no reason to believe there ever was an apology in any form. Mr O'Brien also told the jury he was not able to find a letter from the previous owner of the Sunday Business Post newspaper claiming that he had ultimate editorial control of the newspaper. Under cross examination last week, Mr O'Brien suggested that if the then editor of the Sunday Business Post, Ian Kehoe and the journalists had consulted the newspaper's then owner, Conor Killeen, the articles would not have been published. Mr O'Brien said he had a letter from Mr Killeen saying that as owner, he had ultimate editorial control of the paper. This morning, Senior Counsel, Michael McDowell, for the newspaper, said Mr O'Brien had been given an opportunity to find this correspondence with Mr Killeen. Mr O'Brien said he went and looked for the letter but couldn't find it. He said he remembered there was a letter but unfortunately it was not in any files. He said he "entirely disagreed" that there was no such letter - he said he remembered it and remembered having conversations with Mr Killeen as well. He said he had not asked Mr Killeen over the weekend if he had a copy of the letter as he said he thought it was pointless. He said Mr Killeen had been the owner of the Sunday Business Post until recently and he was not sure he would have been in the mood to co operate with him. Mr O'Brien also told the court that he "entirely disagreed" with Mr McDowell, that the spread of Anglo Irish Bank's lending was a matter of public interest and that Tom Lyons was entitled to inform the Irish public about the huge amount of indebtedness concentrated on a small number of people including Mr O'Brien. In relation to the Sunday Independent article, the court heard that journalist, Tom Lyons, who was then the paper's deputy business editor, had put a number of questions to Mr O'Brien about his loans with Anglo Irish Bank before the article was published in April 2012, including what his borrowings peaked at and how much he currently owed. Mr O'Brien said he would not have answered these questions and told his spokesman, James Morrissey, to make no comment. He said that was a polite way of putting it, as his private banking matters were private and confidential. He said anyone who asked that would be told to "get off" and the details of his indebtedness to Anglo were none of Mr Lyons' business whatsoever. He told Mr McDowell he would not be backing down from that position. Mr McDowell said he appreciated Mr O'Brien's desire for privacy, which he said was well known and had been well demonstrated in a number of ways. But Mr McDowell put it to Mr O'Brien that he was alleging Mr Lyons had been malicious in his publications of articles in the Business Post without having rung him to ask him for a comment. Mr O'Brien said if he had been asked if he was an overstretched, highly borrowed developer king, with access to cheap and easy money, he would have answered no. He asked why any citizen of this country would answer questions from a journalist about his bank accounts and he said: "You'd want to have a bolt missing out of your head to do that". Emails between Mr Lyons' boss at the Sunday Independent, business editor Nick Webb, and Mr O'Brien's spokesman, Mr Morrissey, were read to the court. In the correspondence, from August 2012, Mr Morrissey described Mr Lyons as unprofessional and his conduct as unacceptable, for failing to put the alleged figure for Mr O'Brien's Anglo borrowings to him. Mr O'Brien said he would not have confirmed or denied the figure if it had been put to him. He said Mr Lyons got the figure wrong but refused to tell Mr McDowell by how much, and accused Mr McDowell of also trying to invade his privacy. Mr McDowell asked how he could have believed there was an apology for the article, as far from there being any apology, the Sunday Independent gave it back to him with both barrels, telling Mr O'Brien he had defamed Mr Lyons and asking him to desist. Mr O'Brien said there had been an apology about another matter. He said he had tried to clarify the issue last week but had ended up causing more confusion and he apologised for that. Suggested to him that he was quite happy to defame someone else in correspondence and then come "whinging into court" with a wholly misleading account of what happened, Mr O'Brien said that was not a description he would use. Mr O'Brien said he did not see the term "buccaneer" used in the Sunday Independent article as derogatory but the term "gang" used in the Sunday Business Post was. Mr McDowell explained the term buccaneer as a Pirate "originally operating in the Caribbean" and someone who acts in an unscrupulous way, especially in business. Mr O'Brien said there was no comparison between the way the Sunday Independent wrote about him in 2012 and the way the Business Post wrote about him in 2015. Mr O'Brien said the articles about his banking affairs were verging on voyeurism and "not fair". He said he had never been a burden on any bank. Mr McDowell put it to him that Anglo Irish Bank was hopelessly insolvent in 2008, while pretending it was solvent and that it was a matter of public interest where the spread of its lending was at the time. He said Tom Lyons felt and still believed he was entitled to inform the public of the huge amount of indebtedness concentrated on a small number of people, including Mr O'Brien. Mr O'Brien said they were going to disagree on that. Mr O'Brien also denied again to Mr McDowell that he was a property developer. He insisted he was a property investor who held on to assets long term. He said his golf and leisure estate in Portugal - Quinta da Lago - had not been officially on the market, at one time, for €220m. He said his wife suggested he should sell it as, when he went there, people would come up to him to complain about the state of the greens. However, he said his mother - who is in her eighties - told him she would be very upset if they sold it, and it was not sold. Mr O'Brien agreed that most of the 22 people named in the Sunday Business Post's article about the banks' top borrowers under the headline "the gang of 22" were good people. He said he was a good person. However he said the damage was done in the articles which appeared on previous pages. Put to him that what he had in common with the other people is that PWC had put together a list of the 22 top borrowers, he said he did not know that because the Sunday Business Post had destroyed its copy of the report. He said he did not think PWC would have used the descriptions used in the newspaper. He said he was only concerned about himself and was only in court on his own behalf. Mr O'Brien denied a suggestion that no one thought any worse of him because of the article. He said it was a hatchet job page by page and got more juicy and salacious as the pages went on.